In the first post of my series posts for Pat: real food for busy women, I suggested the necessity of a crockpot to make meals fast. And I gave you the easiest possible slowcooker pot roast recipe, just using frozen stew vegetables and a chuck roast. 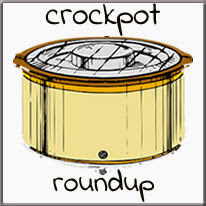 Today, I am posting a crockpot roundup, a bunch of yummy recipes from my favorite bloggers. It turns out that my "cheap & good" blogging friends are enthusiastic about helping out those of you who need to be "fast & good"! My criteria for including recipes in this roundup are that it must take less than 15 minutes to prepare in the morning and the recipe must be able to cook for 8-10 hours unattended. So all these recipes are ideal for busy working women, even if not as simple as the crockpot recipe I gave you to start with. Slow Cooker Pot Roast with Shallots and Baby Carrots from The Organic Kitchen is a slightly more complex recipe than mine, requiring you to brown the meat. If you do this while you peel a few carrots and shallots, it will take 10 minutes over my extremely simple recipe. But due to the Malliard reaction (a chemical explanation for the awesome thing that happens when you brown food), that 10 minutes will buy you a much more delectable meal. Pork Hock and Cabbage Stew from Good Not Perfect includes garlic, bay leaves, thyme, cayenne, black pepper and apple cider vinegar, resulting in a flavor very different than the typical stew. If you start with a bag of shredded cole slaw mix to replace the cabbage and carrots, and use frozen minced garlic (which is much yummier than the jarred stuff), the only chopping would be a few celery stalks. So you could put this together in about 10 minutes before work and there's nothing to do when you get home but remove the bone and dive into deliciousness. Crock Pot Turkey and Pinto Bean Chili from Whole Food Mom on a budget is a bit different, in that the some of the work occurs the night before rather than in the morning. Basically, you start the dry pinto beans in the crockpot at night so they have plenty of time to cook. In either the evening or morning, you fry up some ground turkey, onions and garlic. Then you add the cooked meat, some canned tomatoes, and seasonings (including cocoa!) to the crockpot and come home to the fragrance of lusciousness filling the air. Slow Cooked Pulled Pork from Economies of Kale involves mixing some herbs and spices and rubbing them on a skinned pork shoulder before plopping it in the crockpot and letting it go. Add some bagged salad on the side for a complete meal. If it were me, knowing I had this waiting for me at home, I'd stop at an artisan bakery for a nice loaf of sourdough to serve it on. This is truly a scrumptious and nourishing dinner, plus the recipe provides plenty of leftovers. Crockpot Whole Chicken Fajitas with Corn and Cilantro Sauté from Live Simply involves mixing together seasonings to rub on a whole chicken and topping with peppers, onions & garlic (use frozen to save chopping). After work, you can make the optional corn and cilantro sauté - it's about 10 minutes to fry onion in butter, then stir in frozen corn & cilantro and top with lime juice. Make sure you have tortillas and your favorite condiments on hand (shredded cheese, guacamole or sour cream, salsa or pico de gallo) to maximize your culinary delight. Venison Stew from Healing Cuisine by Elise is another recipe that takes advantage of the delicious flavors of the Malliard reaction. If you don't have access to venison, this recipe would work just as well with beef, but has been developed specifically to make game meat truly delectable. To save time, I'd use frozen onions, cauliflower, carrots and garlic, so only the potatoes and celery would need chopping while the meat seared. Throw some broth, wine and seasonings in the crockpot with your meat and veggies, and cook on LOW instead of high, and you've got a complete, nourishing meal when you get home. EASY Slow-cooker Chicken and Bone Broth Baby! from Green Plate Kate is the fastest thing to start in the morning: plop in a chicken, salt & pepper and water. When you get home, nuke a "baked" potato; serve the chicken and broth over that with a green salad. Most of the work is after dinner, disassembling the leftover chicken to store. Cook the carcass and leftover broth to make a rich stock for the next night, when you can just add some nuked frozen veggies & leftover chicken to make soup. I get 2 dinners and 2 lunches for 2 adults out of a 4 lb bird. Drunk Paleo Beef Short Ribs from from Paleo Gone Sassy is another recipe that requires searing the meat in the morning for that utterly scrumptious flavor. While your meat browns, cut some mushrooms in half and slice an onion. Then dump it all in the crockpot with a few cups of red wine. I'd probably use a Cabernet Sauvignon - I like dry wines best and CS is very rich. Envy it relaxing all day in it's alcoholic hot tub while you slave away at work. ;) When you get home, I'd suggest one of those nukable bags of frozen veggies to go on the side; green beans would be good. Paleo Crockpot French Onion Soup is also from Paleo Gone Sassy. If you do this one back-to-back with the short ribs recipe, you can use the leftover red wine/beef broth, which would be particularly yummy. This is another recipe where most of the work is the evening before, perfect for those of us who are not morning people (guilty!) You slice the onions and cook them with fat overnight to caramelize, which is a heck of a lot simpler than the Julia Child method I've been using. In the morning, just add broth and thyme and cook until you get home. This is very rich, so fruit would be a good dessert. And while not Paleo-approved, I'd probably serve this with a crunchy loaf of artisan sourdough slathered in real butter. If you don't have a crockpot yet, you need to immediately head over to my first post in this series and buy one!